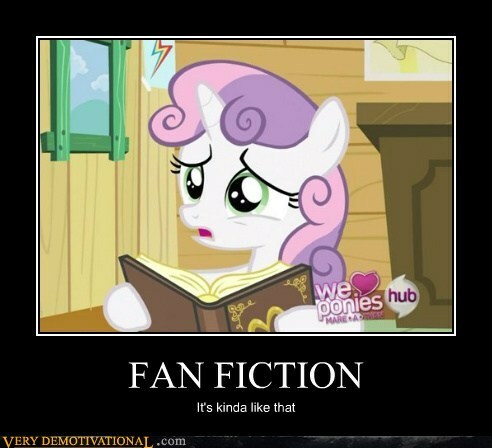 I’m not as big a fanfiction reader as I once was. I think my problem is that I have too much taste. The bulk of my early writing-for-others experience came as a member of what was the best fanfic writing community I’ve ever had the privilege to be a part of. The vibe was laid back and friendly, with all the injokes and silliness that make a fan community great. In addition, everyone there was dedicated to the common goal of improving as a writer, and helping others improve. Constructive criticism was the rule of the day, and while you had to grow a thick skin about your work, if you could take the heat you would improve as a writer. I’m in a Ph.D program, and am occasionally complimented by professors and members of my cohort on my writing chops and attention to detail when building an argument. While most of that is due to my dumb luck at being born with linguistic talent, which was further honed by my mom (the best editor I’ve ever had the chance to work with), I think at least a tiny bit of the credit goes to the years I spent with that group. There are times when I revise my work, and I can almost hear the old list war cry of “more detail!” as I hunt for sloppy arguments or vague generalizations. This is a great trait to have as a writer, but it brings frustrations as a fanfiction reader. To be blunt, I simply can’t enjoy 90% of what’s out there, from whatever fandom. I’m as prone to typos as the next author, but incoherent plots and weak motivations set my teeth on edge. If you’re going to tell a story, then tell a STORY. Give your characters plausible motivations, and explain them to your readers. Also, if you’re writing fanfic, keep your characters IN CHARACTER! Otherwise, just write original fiction. If you want to write a thinly veiled political or religious tract, just write the damn tract. Don’t try to shoehorn it into an incompatible fandom or character. Finally, AUs have their place. Every universe has its interesting “what if?” inflection points, and alternate history has been a staple of fiction since at least Harry Turtledove. However, it’s frustrating to see how seldom they’re done well. This could be my personal bias towards canon-compliance, but I prefer universes that seem like a plausible variation on events in the canon. All things in fiction are possible. Not all of them are likely. At the end of the day, it seems like bad fanfic writers sometimes want to have it both ways. They don’t want to hone their craft because “it’s just fanfic”, but they want a fawning audience of fans, too. I’m sorry, but in the real world you can’t have both, at least not for long. Good writing takes hard work.